The safety professionals at MANCOMM created this picture through extensive Photoshop retouching, so no workers or animals were actually endangered. 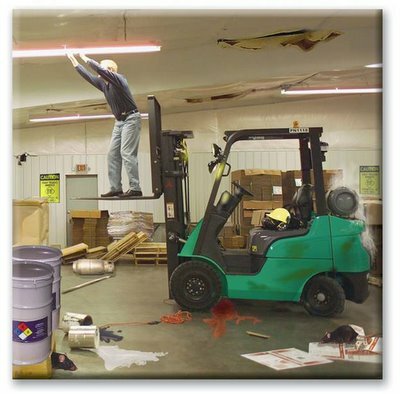 In the picture, how many Occupational Safety and Health Administration (OSHA) safety violations can you spot? Some of the violations are fairly obvious, but some will require a keen knowledge of OSHA regulations. Consider yourself well-versed in OSHA matters if you can spot at least 10 violations – more are listed in the answers. Give yourself a pat on the back if you can quote the regulation number or numbers that address each violation. Answers will be posted on Monday, November 21. MANCOMM and its partner company, American Safety Training, Inc., work together to develop and provide OSHA compliance safety products and training for both general industry and the construction industry. For TFM’s OSHA coverage, see “OSHA Compliance Made Easier” by John P. Kelly of BOMA International.